Happy Monday. Hope you had a great weekend. We had a very uneventful low key weekend. I got caught up on things around the house, got organized for the week ahead, watched some movies, and played with cars and Duplo Lego's a lot. I wouldn't have it any other way. It was Ella's weekend with her dad, we missed her lots and glad she is home and back to our routine today. Today I am just sharing a bunch of random thoughts. Normally Monday's I share our weekend wrap-up but since we didn't do too much, there is nothing to share. - I'm joining in another book club starting Feb 5th we are reading Love Unending by Becky Thompson. - Who doesn't love photo challenges, I know I do when I remember to actually take the pictures. 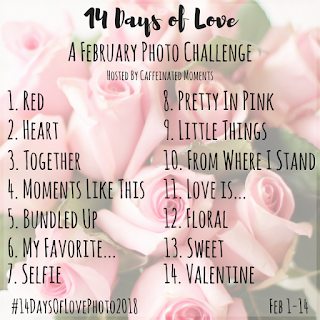 I am joining in on the 14 Day of Love Photo Challenge for February. - I signed up for a daily devotional e-mail from Proverbs 31. I have to admit I am really enjoying them. This is something totally new for me. - I know I say I love winter. Snow is beautiful. But I am over it. give me spring. Not much on our schedule for this week. Girl Scout cookies sales in coming to an end, gymnastics on Thursday, planning/preparing for a new month, Ella has a memaw day on Saturday and Brian and I have a day date.